When building a college list, it’s critical to check college graduation rates. Paying for college is hard enough without adding a fifth or six year to the tab! And yet most students do not graduate from college in four years. Many parents whom I’ve talked to over the years seem shocked by this reality. It is understandable since schools with mediocre or worse grad rates don’t like to share them. You’ll also want to examine the grad rates based on gender at individual schools. Women graduate at a much faster rate than men at both public and private four-year institutions. At private colleges and universities, women’s four-year grad rate is a whopping 13.7 percentage points higher. 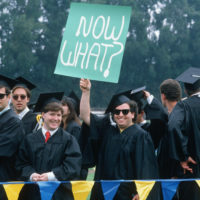 You can find the gender grad rates for individual schools at the website of College Completion, which is a microsite of The Chronicle of Higher Education. When you type in the name of the school, you can click on the Men or Women hyperlink in the right-hand corner. Here is an example from the University of Wisconsin, Madison that illustrates that the gender gap can even be present at highly respected, selective institutions. There is also a wide variation among people in different ethnic and racial backgrounds. The chart below shows six-year grad rates in different categories. 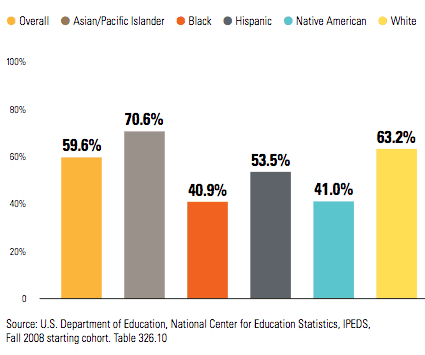 Asians have the highest grad rates while blacks have the lowest. Not surprisingly, the most elite schools, which primarily educate wealthy students, enjoy the highest grad rate. At four-year institutions where the acceptance rate is less than 25 percent of applicants, according to federal statistics, the six-year graduation rate is 88%. In contrast, at colleges with open admissions policies, only 32% of students complete a bachelor’s degree within six years. The reasons for this disparity are fairly obvious. The parents of the students attending these schools are much more likely to be able to pay for a bachelor’s degree and watch their children graduate in the traditional eight semesters. Another explanation for high grad rates is that elite schools only accept exceptionally qualified students, who have the academic ability to earn a bachelor’s degree on time. In addition, wealthier schools are much more likely to offer students the classes they need to graduate in a timely manner. 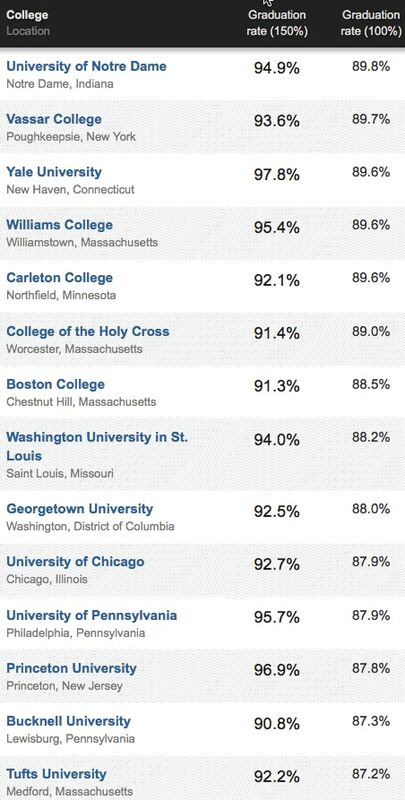 Below are the schools with the nation’s top grad rates. The University of Notre Dame enjoys the highest four-year grad rate of any school in the country. 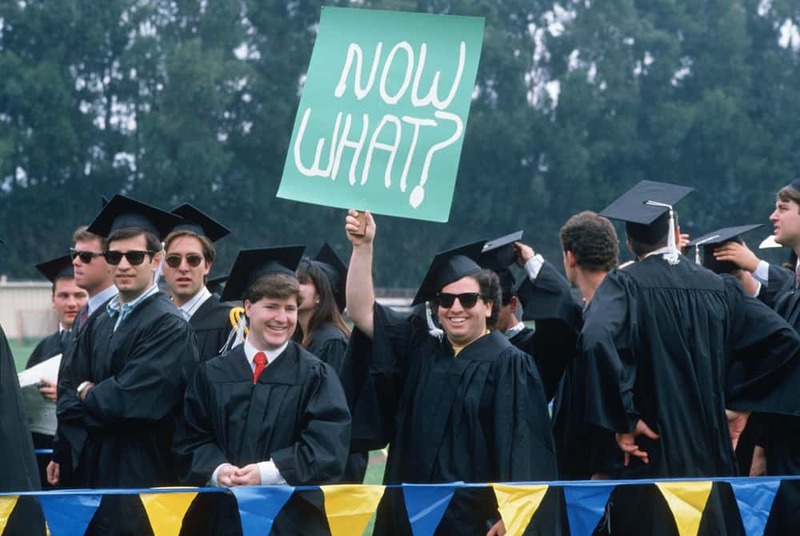 In contrast to the experience of students at wealthier institutions, plenty of other students have to drop out of school, at least temporarily, or transfer to a cheaper institution because they can’t afford to continue. These students can be less likely than their wealthy peers to handle the rigors of college. Another huge problem for students at less selective schools is that students can’t get the classes that they need to graduate on time. 1. If a grad rate is troubling, research what it takes to graduate in four years. Being in an honors college at a state university, for instance, could make the path to a four-year degree smoother. In contrast, students pursuing engineering, nursing or some other majors might find it difficult to graduate in the traditional four years at some institutions. 2. You can find significant graduation differences among schools that attract the same kind of student body so don’t make assumptions. Great post Lynn! As you point out, the most selective, elite, and expensive schools have the highest graduation rates. How does one get the most bang for the buck in terms of graduation rate? Is aiming for a school that graduates at least 50% of its class in four years setting the bar too low?